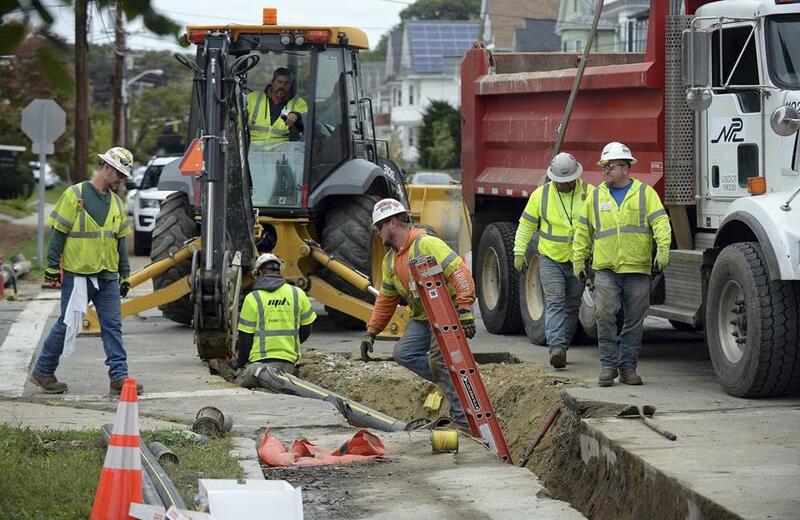 Technicians worked earlier this month to replace miles of gas lines that were damaged when dozens of gas explosions ripped through three Massachusetts communities in September. Columbia Gas of Massachusetts completed a critical step Tuesday in the effort to restore gas to the thousands of customers affected by the Sept. 13 natural gas explosions: The utility company has now replaced all of the gas mains in the Merrimack Valley that had been damaged in the disaster — some 45 miles of underground pipes. The completed job, three weeks ahead of schedule, will allow recovery coordinators to focus on fixing the equipment inside homes and businesses, a bigger challenge given the aging condition of many of the Lawrence area properties. “Over 29 days, (emergency response crews) pulled together to complete this unprecedented engineering operation efficiently, and most importantly — safely,” said Joe Albanese, a former Navy construction commander tapped to lead the recovery effort on behalf of Columbia Gas. Replacing 45 miles of pipeline within Lawrence, North Andover, and Andover by a Nov. 19 deadline was originally seen as a mammoth job, with many experts predicting it could not be done safely under that time constraint. But, with hundreds of construction works, the recovery team finished replacing the old steel and cast iron pipes, as well as approving 12 miles of main line polyethylene pipe, and some 5,000 service lines to people’s homes. But getting private properties “house ready” has proved more difficult. Columbia Gas originally planned to replace all gas appliances, but the aging housing stock in the area required additional repairs before appliances can be reconnected. Officials say they will now see whether the existing appliances can be safely repaired and reconnected to the gas lines immediately and will return at a later date to install new appliances. They have set Dec. 16 as a new target date to have all customers back on line. Of the 8,400-plus metered customers who lost service, just over 1,400 have had service restored. Officials have urged residents to seek alternative housing that Columbia Gas has offered through the restoration effort, as cold weather arrives. As of Sunday, 6,897 people — from 1,925 families — had been staying in alternative housing, such as a hotel or trailer. The cause of the disaster remains under investigation, though the National Transportation Safety Board has tentatively identified the trigger as an errant sensor that allowed high-pressure gas to overwhelm local networks. More than 120 explosions and fires were reported across the area. One person was killed, two dozen people were injured, and thousands were immediately evacuated until gas to individual homes was shut off. Milton Valencia can be reached at MValencia@globe.com. Follow him on Twitter @MiltonValencia.